The events of the last few months have seen a revolution in the Ukraine, but the early days after any such transformation are always fraught with uncertainty and danger not least with the response of neighbouring states. The current Russian movement of troops into the Crimean region of Ukraine has exacerbated the natural tensions that follow any overthrow of a government and now the Western powers are faced with the problem of how to respond. The Crimea is a mainly Russian speaking area and the invading force is claiming to be merely looking after its own interests and protecting its people, but the question on many people’s lips is will this move be the start of an attempt to increase Russian influence over the Eastern Ukraine ? It may be helpful to look at the astrology of the situation to understand the pressures that exist. The chart taken for the Ukraine is for the date of independence from the Soviet Union, unfortunately no time is available. The Dissolution of the Soviet Union and its empire was caused by Pluto’s transit through mid Scorpio to conjunct the Soviet Russian Sun. 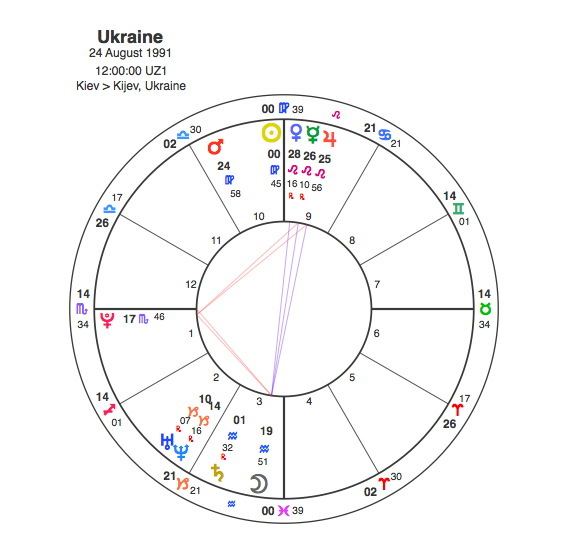 Its only natural that the chart for the Ukraine would have Pluto as a prominent feature but its position at the apex of a T Square slows that change and revolution would be an important and continuing factor in the life of the new nation. The T Square is based on an opposition from the Moon in the idealistic and independent minded sign of Aquarius to a conjunction of Mercury, Venus and Jupiter in Leo. Mercury rules neighbours so it would be possible to see the Mercury / Jupiter conjunction in Leo as the country constantly having to deal with its powerful neighbour, Russia. As a general rule we would look to Pluto’s transits to indicate revolutionary periods, but Pluto is widely aspected to the Sun in the Ukraine chart because the Sun is conjunct the Mercury / Venus / Jupiter group. So when Pluto made its first aspect to the Sun ( a square ) in 1996, this would really be just a confirmation of the set up of the Ukraine itself. This is how it proved as a new Constitution of Ukraine was adopted under second President Leonid Kuchma in 1996, which turned Ukraine into a semi-presidential republic and established a stable political system. The economy had also stabilized by the end of the 1990s as a new currency, the hryvnia, was introduced in 1996. As Pluto moves so slowly there would be no more major aspects until the 2030s. In the absence of Pluto transits we would look for major conjunctions of the other slow moving planets and for revolution particularly Uranus. Uranus was conjunct the Ukraine Sun in 2004, in time for the Orange Revolution. In 2004, Viktor Yanukovych, then Prime Minister, was declared the winner of the presidential elections, which had been largely rigged, as the Supreme Court of Ukraine later ruled. The results caused a public outcry in support of the opposition candidate, Viktor Yushchenko, who challenged the outcome of the elections. This resulted in the peaceful Orange Revolution, bringing Viktor Yushchenko and Yulia Tymoshenko to power, while casting Viktor Yanukovych in opposition. At this point it would be useful to look at the charts of these three major players in Ukrainain politics of the last decade. With the charts of political leaders, Capricorn Research finds it best to focus on the aspects between the planets rather than the signs. While the signs of the Zodiac can give a good insight into the personalities, it is the aspects that really show the themes of their career and the transits that indicate the timeline for these themes. Its also very useful to do synastry between the various charts to show how they would interact with other politicians. Yanukovych has the Sun in the 10th house conjunct the Midheaven which is always a good placing for high political office. The Sun is in Cancer, a sign that is inclined to keep things as they are so it usually fits with a conservative or right wing viewpoint. His Sun is in square to a Mars / Neptune / Ascendant conjunction. The Ascendant is all about image so the picture that Yanukovych wants to portray is of a diplomatic Libran. Planets rising, however will always alter and even distort the expression of the Ascendant. Yanukovych has a Mars / Neptune conjunction rising and this pair is square his Sun. Mars rising particularly in square to the Sun indicates someone who is a fighter. Neptune is a planet that is not really comfortable in the world of politics. It belongs more in the arts or the area of religion and spirituality. In political charts it usually works to undermine careers and there is often some kind of scandal or even a sense of cheating or underhandedness. Yanukovych has a T square which focuses onto an apex Venus in Gemini in the 9th house. As the 9th house rules foreign countries and Gemini has an association with neighbours it is fair to suggest that this placing gives him a good relationship ( Venus ) with Russia. Yanukovych also has some very close astrological tie ups with Russian leader Vladimir Putin. Putin’s Sun is square Yanukovych’s Sun but it is also conjunct his Mars / Neptune / Ascendant combination. So they may be coming from different places but there is an indication that Putin ( Sun ) is very comfortable with ( conjunct ) Yanukovych’s image ( Ascendant ). This contact may well be a mixed blessing for Yanukovych as Putin’s Sun is conjunct the restrictive and authoritarian Saturn. Putting Putin’s Saturn into his Ascendant / Mars / Neptune adds to Yanukovych’s right wing credentials and is certainly not going to help in terms of popularity with any reformist Ukranians who may be more inclined towards Europe. Yanukovych’s political career began when he was appointed as a Vice-Head of Donetsk Oblast Administration in August 1996 as Jupiter was opposite his Sun and square his Mars / Neptune / Ascendant. He was appointed Ukraine Prime Minister in 2002 as Pluto was opposite his Venus. In the 2004, Ukrainian presidential election as the Party of Regions candidate, Yanukovych’s main base of support emerged from the southern and eastern regions of Ukraine, which favour close ties with Russia. In the first round of voting held in October 2004, Yanukovych took second place with 39.3 percent of the votes to opposition leader Viktor Yuschenkowith 39.8 percent. Because no candidate passed the 50 percent threshold, a second round of voting was scheduled. In the second round of the election, Yanukovych was initially declared the winner. However, the legitimacy of the election was questioned by many Ukranians and allegations of electoral fraud and voter intimidation resulted in campaign of civil resistance with protest demonstrations and general strikes organised by the opposition movement. Yuschenko’s party colours were orange and these protests became known as the Orange Revolution which succeeded when the election was annulled by the Supreme Court of Ukraine, and in a repeat election Yanukovych lost to Yushchenko. This was always going to be a difficult time for Yanukovych as the restrictive Saturn was conjunct his 10th house Sun, so a fall from high office was inevitable. But whereas Saturn was conjunct Yanukovych’s Sun, Uranus was conjunct Yushchenko’s. This is a simple astrological demonstration of a successful revolution. Out with the old conservative forces ( Saturn ) in with the new rebels ( Uranus ). Yuschenko’s Sun is at 4 degrees Pisces and Uranus was conjunct his Sun in 2004. Interestingly Yuschenko also has a Sun / Mars square aspect and he first came to power as Prime Minister in 1998 when Pluto was conjunct his Mars and square his Sun. The co leader of the Orange Revolution was Yulia Tymoshenko a business woman in the gas industry who was one of the richest people in the country. There is no time available for Tymoshenko so a noon chart is taken. Tymoshenko’s Sun is at 6 degrees Sagittarius in square to Yuschenko’s but of course this means that she also had a Uranus transit in 2004 – 5, square to her Sun. Pluto was conjunct Tymoshenko’s Sun in 1996-97 when she made a dramatic sudden entrance onto the political stage. By 1999 she was Yushchenko’s deputy in the fuel and energy sector and was responsible for a number of reforms to the energy market. This, however created some opposition amongst powerful oligarchs. Tymoshenko has an explosive Sun / Pluto square aspect and her political experience has been one of significant change. Despite being Yuschenko’s colleague and deputy, the two have their Suns in square aspect so there’s bound to be some clashes on the way. She also has a Mars / Saturn opposition so its inevitable that she would attract a lot of opposition from conventional political groups ( Saturn ). In January 2001, president Leonid Kuchma ordered Yulia Tymoshenko to be dismissed. Prime minister Yushchenko accepted her dismissal, despite her achievements in the energy sector. The Ukrainian media called it “the first betrayal of Viktor Yushchenko”. In February 2001, Tymoshenko was arrested and charged with forging customs documents and smuggling gas. Her political supporters organized numerous protest rallies and in March the charges were found to be groundless and the arrest was cancelled. Tymoshenko was also involved in a mysterious car accident that she survived with minor injuries – an episode some believe to have been a government assassination attempt. Tymoshenko became a popular figure during the street protests of 2004, and was given the title the “Ukrainian Joan of Arc” and the “orange princess”. She was appointed Prime Minister in January 2005. There is definitely a problem with political alliances made by leaders with their Suns in square aspect. The current British coalition between David Cameron and Nick Clegg is a example of a combination of two people who are instinctively designed to pull in different directions. But Yulia Tymoskenko’s Sun / Pluto square creates more problems for the partnership. In September, Tymoshenko’s government was dismissed by President Yushchenko. He said that Tymoshenko was serving interests of some businesses and accused her of betrayal of “Orange Revolution” ideas. Tymoshenko blamed Yushchenko’s closest circle for scheming against her and undermining the activities of her Cabinet. She also criticised Yushchenko saying that he had “practically ruined our unity, our future, the future of the country”. At the time, Tymoshenko saw a rapid growth of approval ratings, while president Yushchenko’s approval ratings went down. Its interesting to note that both Tymoshenko and Yuschenko’s Suns are in hard aspect to Viktor Yanukovych’s Moon, Tymoshenko by opposition and Yushchenko by square. 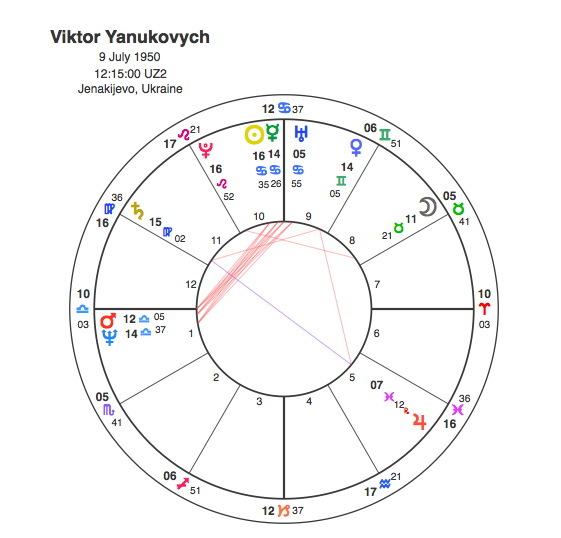 However the political conflict with Yanukovych is much stronger from Yulia Tymoshenko’s perspective as her Mars is conjunct his Sun in Cancer and therefore he would trigger her difficult Mars / Saturn opposition. In August 2006, Yushchenko appointed his onetime opponent in the presidential race, Viktor Yanukovych, to be the new Prime Minister. This was generally regarded as indicating a rapprochement with Russia. It didn’t last long as Yushchenko signed an order to dissolve the Parliament and by the end of 2007 Tymoshenko was again Prime Minister. The conflicts with Yushchenko continued although he claimed that they were not due to personal differences, but to the incompleteness of the constitutional reforms of 2004. The 2010 Presidential election brought all three of them as candidates but marked the end of Yuschenko’s reign as he scored the lowest vote in history. He intends to stand in the 2015 election. The winner in 2010 was Viktor Yanukovych. The loser was definitely Yulia Tymoshenko. The year 2011 saw Tymoshenko’s Saturn return, which is a difficult time for most people but when Saturn is opposite your Mars and also opposite the Sun and square the Mars / Neptune / Ascendant of a right wing President you should be expecting a fair amount of trouble. In 2011, Yulia Tymoshenko was charged with abuse of office concerning a natural gas imports contract signed with Russia . According to Yanukovych, the case was part of the fight against corruption in the Ukraine. She was found guilty of abuse of power and sentenced her to seven years in prison. She was also charged with embezzlement and tax evasion and has been investigated as a suspect in a couple of murder cases. The “gas case” trial was viewed by many European and American organizations as a politically-charged persecution that violates the law and both the EU and the US Senate has repeatedly called for release of Yulia Tymoshenko. Coming back to the Ukraine chart, its strongest and most difficult is the T Square with the apex of Pluto. In November 2013, Saturn came to this T Square by transit, conjunct Pluto and square the Moon. This marked a revolution, but because its Saturn rather than Uranus it was bound to bring a whole lot of trouble with it. Whilst this civil uprising was a Saturn transit for Ukraine it was a Pluto event in Yanukovych chart. Pluto moved to create a T Square in Yanukovych’s chart square to the Ascendant and Mars and is due to square his Neptune and oppose his Sun and Mercury over the next two years. This is by far the single most powerful transit of his life and its already turned his life and career upside down. Remembering that Yanukovych’s Sun / Mercury / Ascendant / Mars / Neptune pattern aspects powerfully with Tymoshenko’s Venus / Saturn opposite Mars, we would note that Pluto also triggered this pattern for her and its conjunction with her Venus led to her release from prison in February 2014. At the time, most of the Ukranian population and western observers would have hoped that would be the end of it, with a new political order in the country and Yanukovych in exile. It is a Saturn transit to the Ukraine chart so trouble would not be long in coming. Also having aspected Pluto and the Moon in the Ukraine chart Saturn would have to go on to complete the T Square and make square aspects to Jupiter, Mercury and Venus in Leo in the 9th house. As indicated earlier on in this article, Mercury and Jupiter in Leo rule Ukraine’s large and powerful ( Jupiter in Leo ) neighbour ( Mercury ), Russia and there’s nothing so likely to antagonise such a neighbour as a square Saturn transit. This and the fact that the same Pluto that sent Yanukovych’s government toppling and its leader into exile whilst releasing Tymoshenko from prison, was also square Vladimir Putin’s Sun. Vladimir Putin was for 16 years an officer in the KGB and he has ruled this massive country with a strong consistent presence for the last 14 years. The former Soviet leader Mikhail Gorbachev credited Putin with having “pulled Russia out of chaos” but he has also attracted criticism for restricting press freedom and continuing in office. Putin has a macho outdoor, sporty, image in the media, demonstrating his physical capabilities and taking part in unusual or dangerous acts, such as extreme sports and martial arts and various bare chested interactions with wild animals. Despite or perhaps because of this Putin’s approval rating amongst Russians has always been much higher than any other leader of a major power. This could be because of the significant improvements in living standards or it could be because of the state-controlled television. Putin has an apex Pluto that dominates his chart, indicating a very powerful personality but also one that is inclined to have an explosive temper and to act drastically. This is not the pattern of someone you would want to go out of your way to annoy and if you were to cross swords you would take care that Pluto was not doing anything by transit at the time. Ukraine’s revolution occurring just as Pluto arrived at 13 degrees Capricorn square to Putin’s Sun meant the tanks were sent into Crimea. Putin’s justification for this is that Crimea, although a part of Ukraine has a majority of Russian speaking people and his view that the Ukrainian revolution was an unconstitutional coup has forced him to defend the interests of these people. A referendum for the Crimea to become part of Russia is planned for later this month ( March 2014 ) with the likelihood that there will be a majority of the people in favour. The Ukrainian interim government’s response is that such a move would be unconstitutional. Russia’s action to send the troops in has been widely condemned throughout the western world and the threat of sanctions has been raised. At the moment there is a kind of standoff, so what can astrology tell us about what might happen. Looking at Putin’s chart, Pluto is in position square to his Sun until the end of 2015. This period will be a defining turning point of his life. What that means at the moment is anyone’s guess, it could mark the end of his career or possibly some kind of war over Ukraine. It is a very delicate situation which needs to be handled extremely carefully by western diplomats because there is a very real chance of escalation. There are voices in the western media suggesting this is the most dangerous development in relations with Russia since the end of the Cold War. The astrology of the situation would certainly bear that out. Its likely that things will get worse as Uranus is also coming to oppose Putin’s Sun in April. At the beginning of May, Uranus goes past his Sun and Pluto turns backwards so we may see a slight easing of tensions. Uranus comes back again in October and Pluto again at the end of December so there could be more problems then and through the most of 2015. 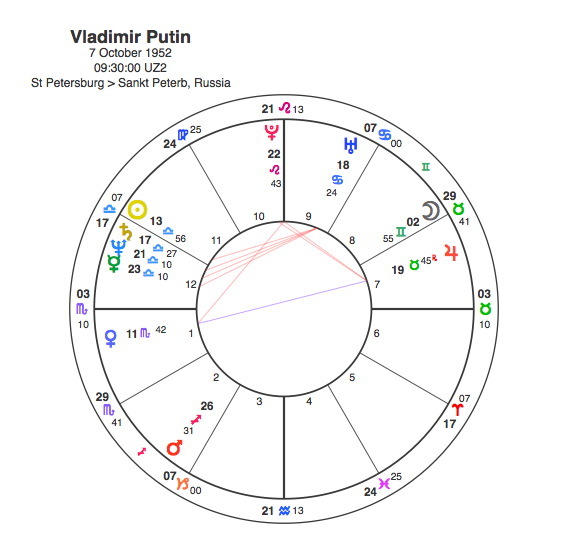 It is worth noting that after the transit to Putin’s Sun, Pluto makes a square to his Saturn and opposes his Uranus in 2016 – 17, and this would be likely to coincide with the end of his time as political head of Russia. For the Ukraine, Saturn will be in the T square for the whole of 2014, but will then go on to square the Sun for most of 2015, so their problems will persist for a while. For Viktor Yanukovych, Pluto is moving to oppose his Sun and square his Neptune between now and the end of 2016, so his current difficulties will continue and the end of his political career should coincide with this transit. 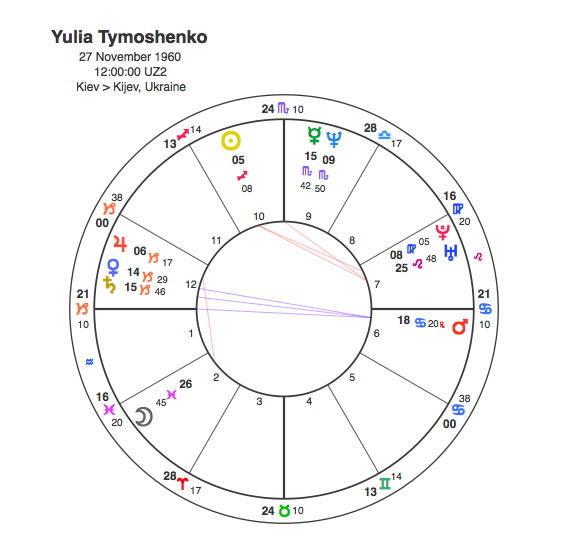 For Yulia Tymoshenko, Pluto is currently conjunct her Venus but it goes on to conjunct Saturn and oppose her Mars, so its safe to say that the turbulent conditions of her life over the last few years are not ever yet. To say the Euromaidan has had a difficult birth would be an understatement. The New Ukraine was born suddenly and possibly prematurely and is currently being carefully monitored by the whole world. We can just watch and hope that Pluto doesn’t cause too much damage.